Would you like to get back in touch with nature, but feel a little overwhelmed at the thought of filling your yard with massive, sweeping colorful garden beds or just feel as though there is no way you could possibly handle gardening on a large scale. Well there is a simple solution – create a miniature garden in a container, instead. It is no surprise that window gardening is rapidly increasing in popularity. After all, when you garden in a window box, you can keep your garden looking perfect without hiring a team of dedicated landscapers. Since you can find a window box to fit any house style, you shouldn’t have a problem finding one that complements your home’s decor. These boxes range from simple pine boxes to fancy wrought iron models. As you look at the different window boxes available, don’t forget to consider the depth of the box. Shallow window boxes dry out very quickly and are harder to maintain. To plant your window box, you will need a good quality potting soil, water retaining crystals, a mulch material, such as dried moss, shredding wood chips, or pebbles, and, of course, plants. Almost any small plant can be grown in a window box. In fact, you can even grow slow growing shrubs in a window box. However, some plants do better than others in this contained environment. The most popular type of window box is one that is filled with flowers. Some good choices are petunias, dahlias, marigolds, and geraniums. If your window box is in a shady area, try begonias or impatiens. Don’t forget to add a few plants that have nice foliage, such as coleus, vinca, or sweet potato vine to fill out your window box. For a fun and unique alternative to traditional window boxes, why not plant a cactus garden in your box? You can find such a wide variety of these amazing plants. For a successful cactus window box, you will need to use a potting soil created just for cactus plants and you will need to be careful that your plants do not get too much rain. If neither of these options is right for you, you may want to create a miniature Japanese garden, instead. Ideal plants for this type of garden are mugho pines, dwarf Alberta spruce, or Bonsai. Don’t forget to add a few rocks and a miniature statue to complete the window garden’s design. For a simple window box that is filled with quiet beauty, you may want to consider a box filled with three to five liriope, hostas, or caladiums. You may also want to create a window box filled with lavender, thyme, or rosemary for a scented alternative. Finally, don’t forget about bulbs. You can create a window box that blooms through several seasons by planting snowdrops, daffodils, tulips, and day lilies in the same box. Look for repeat blooming day lilies to extend the blooming season. 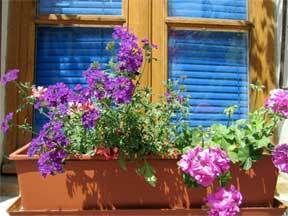 Once you choose a theme for your window box, you are ready to start planting. Fill your window box with your potting soil mix to a point of about four inches below the top of the box. Then, arrange the plants in your window box. When you are satisfied with your design, fill in the space between your plants with more potting soil. Carefully press down the soil around your plants and then water them thoroughly. If you are planting cactus plants, do not over-water them. Now, you are ready to mulch your window box. Spread about an inch of your mulch material over the surface of the window box. This will help you keep the soil moist between watering sessions. Your window box is ready to go. If you want to hang your box, be sure to install the brackets securely by following the manufacturer’s instructions. These boxes can be quite heavy when they are full and a falling box can become a dangerous missile, especially when it is dropping several stories. Even if your box only falls a few feet, your plants or your window box could be damaged. Now, you can enjoy nature in your window box garden without being overwhelmed by a massive yard filled with flower beds that take hours of time to maintain.